SIMI VALLEY, CALIFORNIA (The Nil Admirari) - Tonight, Republican presidential candidates said a bunch of stuff to an audience that thought it knew a bunch of stuff. The candidate who led in the polls prior to the debate was the target of all the other candidates, who gave vague answers to softball questions while Americans outside of Ronald Reagan's shrine continued to suffer from more than three decades of trickle-down economics. RELATED: Louisiana Man Who Turned $1B Surplus Into $1.5B Deficit Calls Trump "Delusional Sociopath"
"The religious extremists said a bunch of stuff about the war gays are waging on Christianity, and the guys who want to blow stuff up overseas said a bunch of stuff, too. There were even some pretend moderates, and everyone blamed Obama. Meanwhile, my family barely avoids financial ruin every month," said Republican primary voter Chip Donnor. 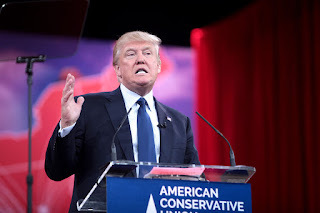 The leading candidate in the polls speaking at 2015 CPAC in Maryland on 2.27.2015. Donnor continued, "And at least three of the Republicans on stage are sitting governors who are hated back home, because they made such a mess of things with their corporate socialism and tax cuts for the rich. Of course, that vision for America was hidden behind talk of 'cutting taxes for all' and 'freedom,' but lacked as much substance as it did facts." At the beginning of the debate, Donnor sat in the audience at the Ronald Reagan shrine and thought he knew stuff, and the guys behind the podiums knew stuff. By the middle of the Republican debate Donnor was vomiting into a waste bucket in the men's bathroom of the shrine of the GOP demigod. Other Republicans in the audience had similar emotional responses to what the Republican presidential candidates had to say, and 95% of those who thought the Republican presidential candidates knew stuff left the debate fearing for the future of America.